Lot of people say they are buying the Mayweather/McGregor fight. Are you? In preparation for Saturday night’s fight, AT&T is promoting the fight, which will be available to DIRECTV and U-verse customers. Cross-country building projections w/ real time polling – Fans in Atlanta, Chicago, Dallas, Houston, Los Angeles, Miami and New York will be able to get in on the action from their hometown. Select buildings in these cities will project massive videos on their structures promoting the fight, along with LIVE polling of Mayweather/McGregor fight winner projections. Below is a list of where projections will take place in each city. So if you live near one of these areas you might want to take part in the action. There is a Fight Microsite for fans looking to enjoy the fight from the comfort of their own home, they can order it on DIRECTV and U-verse through our dedicated microsite which breaks down the matchup and also includes real time polling from twitter. There is also a Sports Bar Finder app – The DIRECTV Sports Bar Finder app on iOS and Android devices helps fans to figure out which locations near you will have the fight available. Last month we did our annual tour of today at the Gatorade Player of the Year Awards, an event that we always enjoy. The overall message and vibe of these events are consistently positive. Gatorade has been recognizing elite high school athletes across the country since 1985. The criteria for selection is based on three different consideration points: athletic excellence, academic achievement and exemplary character. State Player of the Year awards are issued to male and female athletes in all fifty states (and the District of Columbia) across 12 different sports. The 606 state winners are then paired down to a final pool of 12 athletes. From this pool of finalists, one female and one male athlete are awarded Athlete of the Year in Los Angeles just prior to the ESPY Awards. The winners are voted on by a panel of about 400 people, including sports journalists, coaches and other athletes. Past winners at different levels include some of the most successful professional athletes in recent memory. Kobe. LeBron. Peyton Manning. Clayton Kershaw. Allyson Felix. The list goes on and on. For many of these top-notch amateur athletes, this event is their first big spotlight moment – a chance to rub elbows with the elite professional athletes they all hope to become. It’s day for recognizing excellence, nurturing potential and honoring the people who make it possible for young athletes to pursue their dreams in sports. All very positive stuff. As the commissioner of a few fantasy football leagues I am getting psyched that football is back. I know a lot of you like me are looking to plan a great party for your league. Still nothing we all look to do will compare to what Draft Kings is doing later this month. 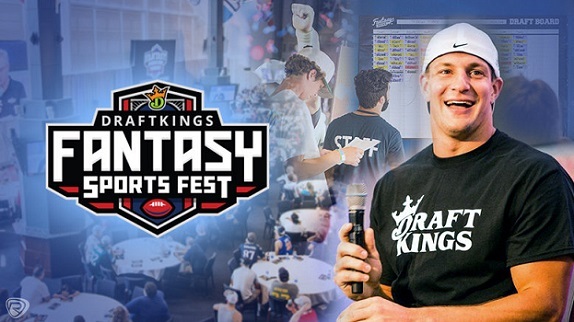 DraftKings, the world’s largest daily fantasy sports company, will be hosting its second annual Fantasy Sports Fest bringing fans closer to the sports and athletes they love. The experience will prepare fans for the upcoming NFL season with fantasy insiders and entertainers, the opportunity to play on the Gillette Stadium field and celebrate with friends throughout activation areas. This year’s event will be hosted by actor, comedian and fantasy sports fanatic Michael Rapaport, with appearances from Rob Gronkowski, Matthew Berry, Trey Wingo, Jim Breuer and Patriots alumni. Fans will receive access to Gillette Stadium and a chance to participate in on-field drills and activities, including a chance to run out of the tunnel – just like the Patriots on game day. I got to chat with Michael Rapaport today to talk about the event, how you can Patriots tight end, Rob Gronkowski, fun activities at Gillette Stadium, how long he has been playing fantasy football and more. Here is my interview with Michael below. Tickets are available in four package offerings. For more information and to purchase tickets, please visit fantasysportsfest.com. Hey NASCAR fans! 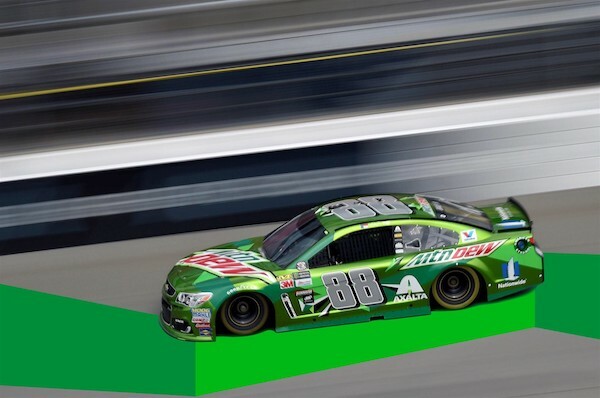 MTN Dew is looking to hook you up with a ride with Dale Earnhardt Jr.. As he approaches the final races of his epic career this fall, Dew is inviting fans to help celebrate Dale Jr.’s final race at Talladega Super Speedway in his last No. 88 Mountain Dew Chevrolet this fall (Oct. 15), giving DEW Nation and Jr. Nation the chance to ride along with him at Talladega via a customized DEW paint scheme. You can enter to have your name placed on the paint scheme through a customized site – www.RideWithJr.com. Registration will be open for up to 100,000 fans to have their names on the car, and fans will receive an email and be able to check the site this fall to see where their name will be placed on the No. 88 Mountain Dew Chevrolet. 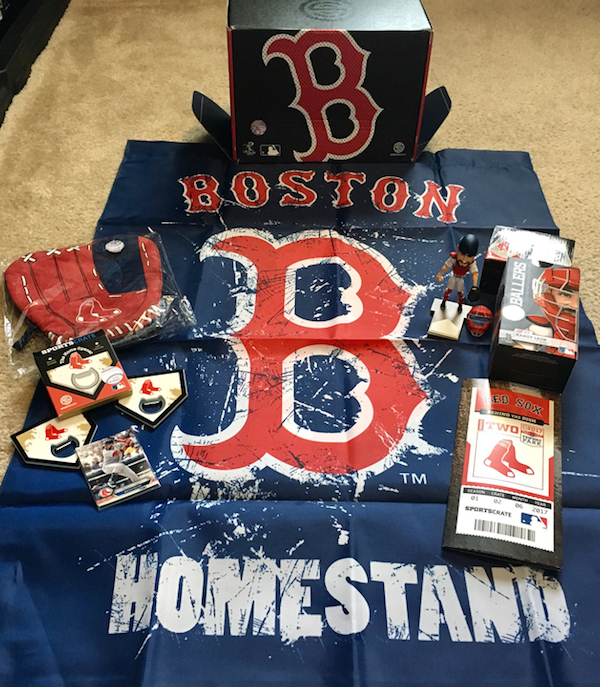 This month I received my second Boston Red Sox Sports Crate. Just like the first one, this crate did not disappoint. This one featured Sandy Leon, who is a catcher for the Red Sox. 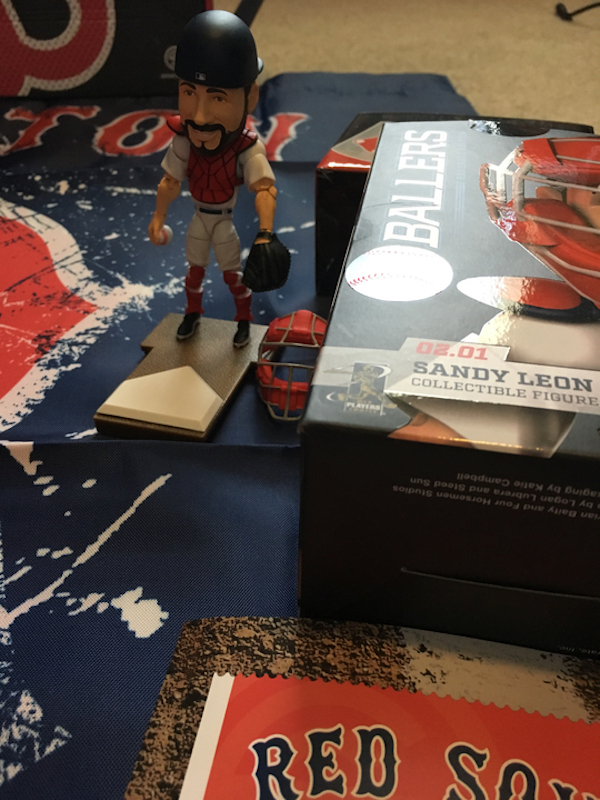 Not only did this month’s crate have a mini figure of Leon, but it came with a baseball card of him too. 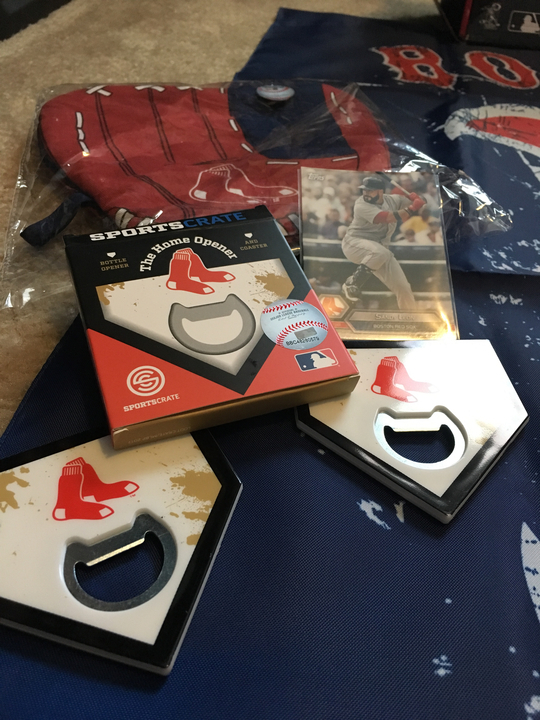 The catcher is there to protect the plate and I was loving the fact that I got two home plate bottle openers with the Sox logo on them! When a pitcher throws the heat you know the catcher can take it so it was only natural for Sports Crate to add a baseball glove oven mitt into the mix for this month. The shot glasses are great will go next to my Red Sox collection in my office. The Boston Homestand flag is pretty big and will be great to display inside or outside your home. With licenses from Major League Baseball and the Major League Baseball Players Association, Sports Crate is now the Exclusive Licensed Subscription Box of MLB. The new division of Loot Crate, Sports Crate will launch with 10 teams initially, providing fans of the Boston Red Sox, Chicago Cubs, Detroit Tigers, Kansas City Royals, Los Angeles Dodgers, New York Mets, New York Yankees, San Francisco Giants, St. Louis Cardinals and Texas Rangers with exclusive apparel, collectibles, experiences and more every month. Sports Crate will roll out additional teams later this year. This week during the NBA award ceremony Russell Westbrook won this year’s MVP trophy. With a newly minted MVP trophy now adorning Mountain Dew athlete Russell Westbrook’s trophy room, the brand is honoring him with a truly unique fashion outfit for his wardrobe: the first ever Triple-Double Breasted Suit. 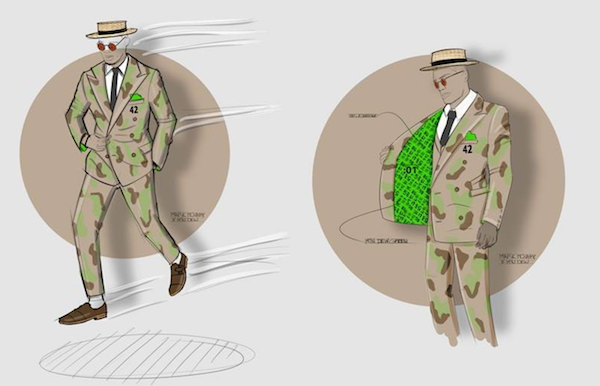 Created by American menswear designer Mark McNairy, the Triple-Double Breasted Suit pays homage to Russ’ record breaking season and “Don’t Do They” mentality – whether on the court dropping 50 point triple doubles, or off the court sporting flashy post-game outfits. 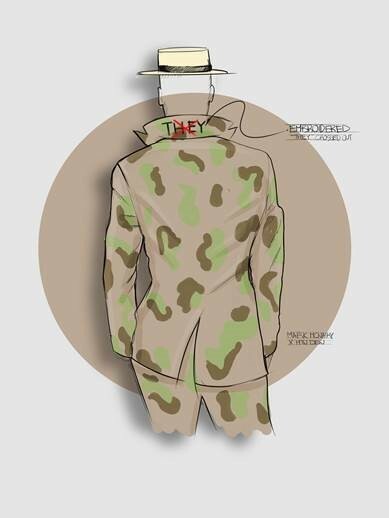 Camo Pattern: DEW has a history with camo as does McNairy which made camo an obvious color choice. Along with the triple-double breasted suit, Dew will also release commemorative 12oz. cans made to honor Russell’s MVP win, which will be available exclusively in the OKC market. Earlier this week 2K announced Seth Rollins as the cover Superstar for WWE 2K18, the forthcoming release in the flagship WWE video game franchise. Rollins will personify WWE 2K18’s worldwide marketing campaign – BE LIKE NO ONE – which invites players to explore Rollins’ identity, as well as those of several other WWE Superstars, while learning more about the game. 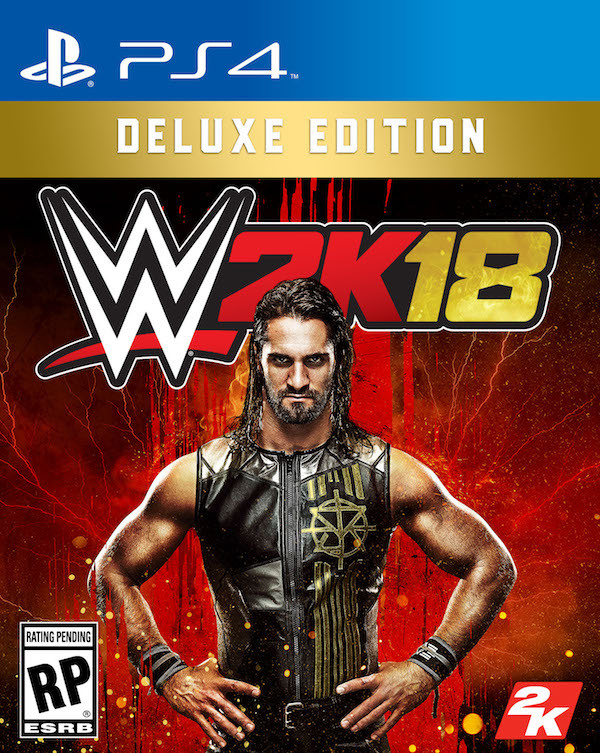 In addition, 2K announced the game’s new Early Access initiative, which invites players to purchase the WWE 2K18 Deluxe Edition or the WWE 2K18 Collector’s Edition and receive the game before its worldwide release on October 17, 2017 for the PlayStation®4 computer entertainment system and Xbox One. These four simple words likely generate several reactions, but for WWE Superstar Seth Rollins™, they are a master class in describing his unmatched work ethic, disruptive mindset and definitive WWE career. Since joining WWE in 2010, Rollins has done things on his own terms. Like many claim but never accomplish, he was destined to be different, blaze his own trail and take no prisoners along the way, even if it meant disrespecting history. The first move on Rollins’ chess board: become the inaugural NXT® Champion in 2012 and put everyone on high alert. The second move: make his WWE main roster debut at Survivor Series® later that year, align with WWE Superstars Roman Reigns™ and Dean Ambrose™ to form The Shield™ and rally against authority. As the pieces continued moving, the accolades followed: two-time WWE Champion, United States Champion, WWE Tag Team Champion and “Mr. Money in the Bank®,” to name a few. And now, “The Kingslayer” stands tall after a definitive checkmate: defeating Triple H® on WWE’s grandest stage at WrestleMania® 33. How do hockey players celebrate winning Lord Stanley’s Cup? They each get to hang with the trophy and do some fun and crazy things with it. 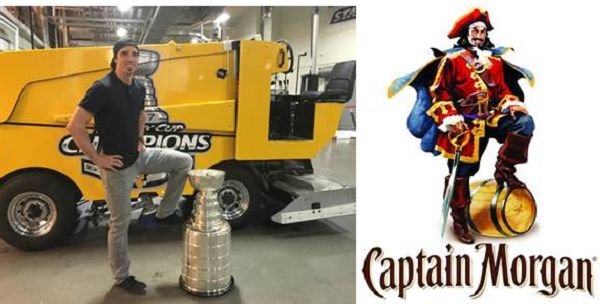 As the Penguins return to Pittsburgh as champions of the city, goalie Marc-André Fleury showed his love for the moment by striking the legendary Captain Morgan pose during his celebration with the best piece of hardware across sports. When the Golden State Warriors were celebrating their NBA Finals Championship they were spitting out beer and champagne at each other. When things sort of calmed down they were looking for a better way to celebrate their victory. 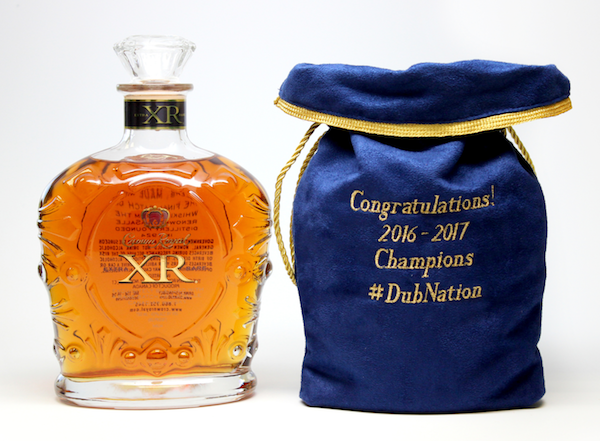 Mychal Thompson, NBA great and father of Klay Thompson, gifted bottles of Crown Royal XR to the entire 2017 championship team. 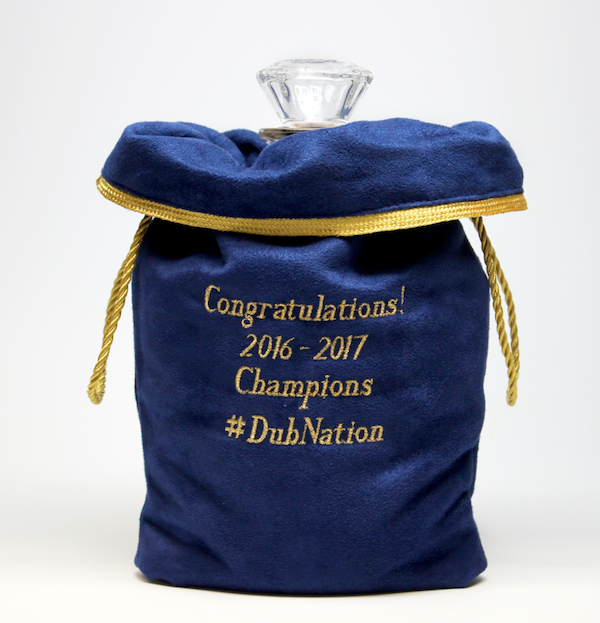 The bottles of $130 whisky come enclosed in a velvet, blue bag that were embroidered to reflect the team’s achievement.And what better gift to get for his son and the rest of the Warriors team, than one originally created for Royalty? I have to say that Mychal knows how to give awesome gifts. A few days ago I received my first Sports Crate. 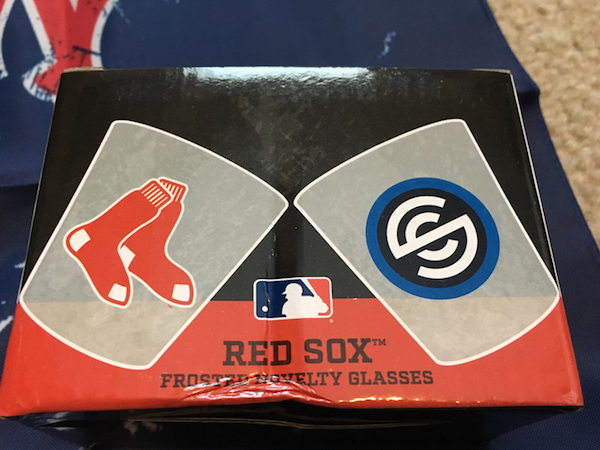 For those who don’t know Sports crate is a new line of subscription products exclusively for baseball fans, marking Loot Crate‘s first foray into the world of sports fandom. With licenses from Major League Baseball and the Major League Baseball Players Association, Sports Crate is now the Exclusive Licensed Subscription Box of MLB. 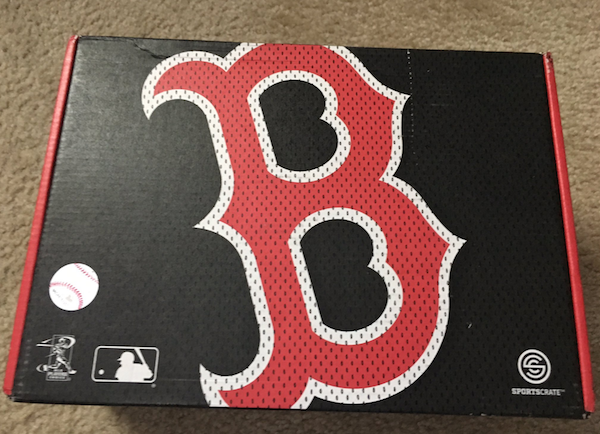 Here is my unboxing of the first Red Sox Sports Crate.